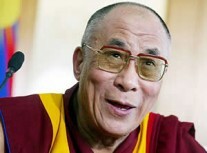 The Dalai Lama in Buenos Aires: "Maintain peace of mind- in every situation!" Tibetan Buddhism originating in India is not old and worn out. People from all over the world can learn something from it. In the highlands of Tibet, with its unique geography and small population, a special feeling of human interaction has come into existence over hundreds of years, one of mutual interdependence, a common way of living and caring. Even foreigners are received there with hospitality, regardless of whether they are known or not and without any expectations in return. Furthermore, Buddhism became even more meditative and reflective and centered on reality here. The Tibetan form of Buddhism has something to offer those in the West, most notably inspiration. The quintessence of human cooperation and all State structures is human trust, and in addition to that honesty and loyalty. Maintain peace of mind—in every situation. A Tibetan priest, for example, who spent 18 years in a Chinese gulag as a political prisoner, said that the most difficult aspect was not to lose compassion for his Chinese guards. In 1958, the Chinese army occupied Tibet. 3000 monks were taken prisoner, 1000 were displaced, and over 100 executed. Before being executed, one of the teachers of the former Dalai Lama prayed for his murderers. It is not the Dalai Lama who symbolizes the faith, but rather it is Buddhism itself—irrespective of whether or not there even is a Dalai Lama. Tibet is now committed to the idea of democracy. In exile, the Tibetans have elected a parliament with a term of five years—the Dalai Lama is now only a quasi-official representative of the State. Tibet does not strive to become independent from China, but rather to receive cultural and domestic autonomy—foreign and security policy can continue to be represented by Beijing. Despite massive oppression for almost 50 years, more than 90% of Tibetans continue to refuse to accept the excessive control from Beijing—murder, torture and intimidation have had and continue to have no effect. This is why Tibet is unstable—only autonomy can bring about real stability. As the Communists in China no longer represent the working class, an ever larger chasm between the rhetoric and hearts of the population has come into existence—a dissonance in the People’s Republic of China. Everyone in the West should inform his or her Chinese partners that in this way no basis of trust can be established with the Chinese—the violation of human rights in Tibet is serious and must be stopped now.